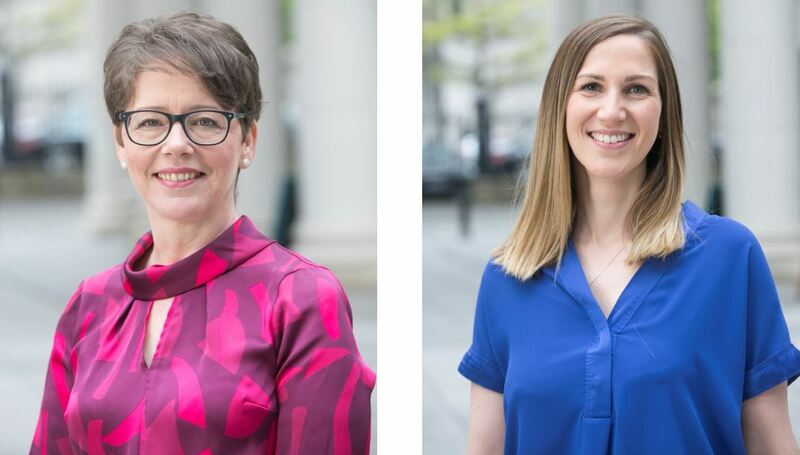 White Ink Architects founder Joan McCoy (left) and company Associate Áine Glackin (right) have been appointed to new roles in which they will influence and inspire professionals in the local architectural community, education sector and construction industry. Director of White Ink Joan McCoy, BSc Architecture 1990, DipArch 1992, has been appointed President of the Royal Society of Ulster Architects (RSUA), the professional body for chartered architects in Northern Ireland. In her new role Joan will endeavour to articulate the value of architecture and the impact of what architects do. Speaking at the time of her appointment in June Joan commented: “Architects, and how we design the built environment, have a far reaching impact on how people live their lives not only today but in the future. Joan also aims to encourage younger architects to involve themselves more in the RSUA, whilst also promoting and supporting diversity to inspire and boost the number of women in the industry. A member of the Queen’s School of Architecture’s Professional Liaison Committee, Joan is also a Sentinus, Construction and STEM Ambassador, and a member of the Northern Ireland Building Regulatory Committee (NIBRAC). She previously sat on the Arts Council Architecture Working Party (development of Policy on Architecture for the Arts Council/adoption by NI assembly) and has tutored at Queen’s. Áine Glackin, an Associate of White Ink Architects, has been shortlisted as a UK Construction Week (UKCW) Role Model. A BSc in Architecture graduate (2002), Áine is one of 38 UKCW Role Models for 2018/19 and was selected from over 140 top quality entries from construction professionals in all walks of the industry. The overall Role Model of the Year will be announced on 10 October. Áine was also recently appointed to the Board of Directors of Place NI which researches, designs and delivers creative projects that connect people to place. A STEM Learning UK Ambassador volunteer since 2013, a CITB NI Construction Ambassador for the last 2 years, and a volunteer for Builders Without Borders in Ciudad Juarez Mexico, Áine has also been an external tutor at Belfast School of Architecture since 2016. UKCW Role Models are currently taking part in an outreach programme, going to colleges and schools to talk to students and teachers at key stages of their education to explain what inspired them to choose the sector as a career and to dispel any myths around the image of construction. For media enquiries and further information please contact Moya Fitzpatrick at White Ink Architects, tel: +44 (0)28 9031 9526.